The report covers a forecast and an analysis of the fire protection system market on a global and regional level. The study provides historical information for 2016, 2017, and 2018 with a forecast from 2019 to 2025 based on revenue (USD Billion). The study covers the key drivers and restraints of the fire protection system market. It also provides the impact of the market within the forecast period. Furthermore, the study also includes opportunities in the fire protection system market on a global level. In order to offer the users of this report, a comprehensive view of the fire protection system market, we have enclosed a detailed value chain analysis. To know the competitive landscape within the market, an analysis of Porter’s Five Forces model for the fire protection system market has additionally been enclosed within the study. The study includes a market attractiveness analysis, wherein all the segments are benchmarked supported their market size, rate, and general attractiveness. The study also includes the market share of the key participant’s operating in the fire protection system market across the globe. The report also covers the strategic development together with acquisitions & mergers, agreements, partnerships, collaborations, and joint ventures, and regional growth of the key players within the market on a regional basis. The study provides a crucial view of the fire protection system market based on product, service, and region. All the segments have been analyzed based on present and future trends and the market is estimated from 2019 to 2025. By product, the global fire protection system is divided into fire sprinkler, fire detection, fire analysis, fire response, and fire suppression. By service, the market includes maintenance, installation and design, engineering, managed, and others. By vertical, the market includes oil and gas, mining, energy and power, manufacturing, government, residential and commercial, healthcare, transportation and logistics, and others. Additionally, the regional classification includes Europe, North America, Latin America, Asia Pacific, and the Middle East and Africa. 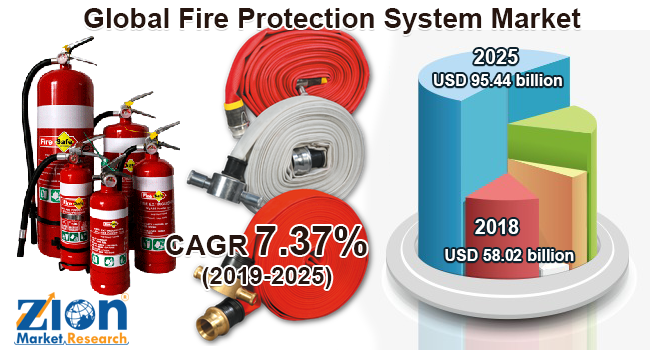 Some key manufacturers of the global fire protection system market are United Technologies, Johnson Controls, Siemens, Honeywell, Halma, Robert Bosch, Minimax Viking, Gentex, Securiton AG, Fire Suppression Limited, Encore Fire Protection, Sterling Safety Systems, Schrack Seconet AG, VFP Fire Systems, and Napco Security Technologies.